Oftentimes, Microsoft Outlook users who are leaving their current employer want to take their mail, calendar, or contacts with them and do one of two things: delete the Microsoft Exchange account from their profile without realizing the Contacts are stored in the Exchange account or they take the OST file with them, not realizing it can only be opened using the account that created it. If you have the OST file but no longer have access to the computer that created the OST or you don't have a restore point, you'll need to use a tool to recover the contents of the OST. A list of these tools is below. Kernel for OST to PST recover corrupt OST files. One can save recovered individual items in PST, MSG, EML, MHTML, MBOX formats. It can export OST files to cloud-based Office 365, email servers and also supports all MS Exchange and MS Outlook 2019/2016/​2013/​2010/​2007 and older versions. The best tool that converts the MS Outlook OST files to PST file with secure conversion of emails, contacts, notes, calendar entries & journals. Supports both 32bit & 64bit of Outlook 2013 and Outlook 2016, with capability to convert encrypted OST file to PST file. You can preview mails before saving into PST file. Beginning with Outlook 2013, Outlook was designed to permanently delete the OST data file when the account is removed from Outlook. If you deleted the account from Outlook and did not export the contents to a pst file or copied the OST file, your chances of recovering data is not good. You will need to use software to undelete files from your hard drive, but successful recovery depends on how much time has passed between deleting the account and running the undelete software as Windows will overwrite the deleted files. To see if the OST exists, type or paste %localappdata%\microsoft\outlook into the address bar of File Explorer. Many of the companies that have OST to PST recovery software also have file recovery software. If your company uses a group policy that blocks PST creation, your choices are limited to exporting calendar and contacts to CSV (or Excel, if you have Excel at home). If you don't have many calendar or contacts, you can forward them to a personal address. If using Outlook 2007 or newer, you can send your entire calendar as an iCal. Check company policies before taking home the contents of your mailbox. If you deleted the Exchange account, you may be able to recover the account if your operating system supports system restore and you only recently deleted the account. If too much time has passed you are less likely to have a restore point available. This method will also work with IMAP accounts in Outlook 2013 and up IF you have a copy of the IMAP data file. Outlook 2013 and up automatically delete the account's OST file when the account is removed from Outlook. The only way you'll be able to use this method is if the OST file exists (because Outlook failed to delete it. It's rare, but it does happen.) To check, look for the OST at %localappdata%\microsoft\outlook before doing a restore. Open the System Restore application. In Settings or the Search field on the taskbar or Start menu, type restore then select Create a restore point in the search results. Click the System Restore button to open the System Restore wizard. You can also open it by typing or pasting rstrui.exe in search field or in the Run command. Pick a date just before the profile was deleted then follow the steps in the wizard. When Windows restarts the account will be back and you can move or export the contents of the OST to a PST. Then either delete the account or run restore again to return to the point made before the restore, after backing up a copy of the newly created pst file. You may be able to use Archive to move or copy many items to a PST. Users Exchange online archive mailboxes will not be able to archive to a pst. 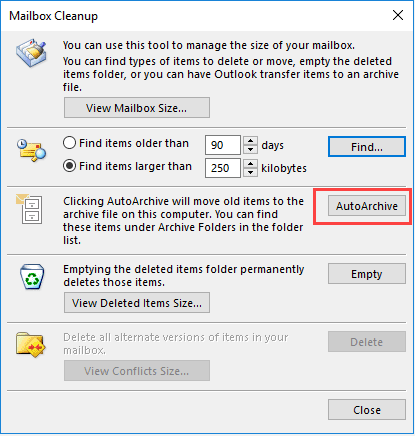 Autoarchive works best when you want to move almost everything in your mailbox, however, you cannot archive Contacts. You'll need to move or copy contacts to the pst file or use Export. Then go to File, Tools, Cleanup, AutoArchive to run it. If you use this method and also need the Contacts, you'll need to move them to the new data file. Although Export is not usually recommended, it works well for moving content from an OST to a PST file. You can export all content from the OST to a PST or just the calendar and contacts. If your company blocks the creation of PST files, export Contacts, Calendar, and Tasks to CSV or Excel format. You'll use this method if you are moving to a new server and need to migrate your own email (or if the server died and there are not backups). Make sure you start Outlook offline so that you don't connect to the new server; connecting to the new server has the potential to delete the mail in the offline file. Export everything to a pst then remove your account and use auto account setup to add it back to your profile. Create a new PST in your profile and drag the folders you want to take with you to the PST. This method will preserve custom views and forms published to folder. Dragging default folders, such as Inbox, Calendar, and Contacts, brings up a message that you can't move default folders. The contents will be copied instead, with the folder named Inbox (1), Calendar (1), etc. If you don't have too many items you want to keep, you can email them to your personal email address. Select the item(s), right click and choose Forward or click Ctrl+F. If you have a lot of messages you want to keep, you could drag them to a folder in Documents, then zip the folder and email the zip file. If you forward the messages to an account that is opened in Outlook, you can drag attached messages from the incoming message and drop it in the Inbox or another folder. 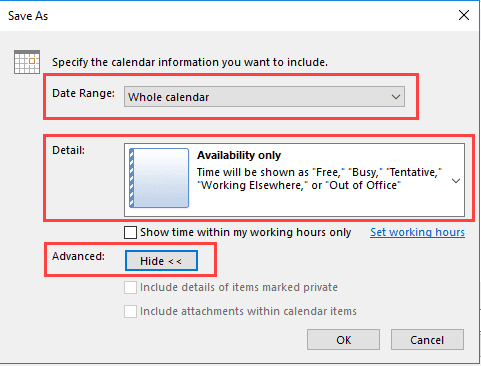 If you are using Outlook 2007 or newer, you can email the entire calendar as a single iCal, provided you use Outlook or another calendaring application that supports multi-event icals at home. Outlook 2003 and older versions of Outlook do not support multi-event icals. To create the iCalendar file, you can right click on the Calendar folder and choose Share, Email Calendar. If you want to create the iCalendar file and do something with it later, select the calendar folder, then go to File, Save Calendar. When you use Email calendar, a dialog will let you choose the date range and other options. If you are saving the calendar to your hard drive, click More Options in the Save as dialog to open this dialog. The defaults are Today and Availability only; you'll most likely want to use whole calendar and full details. Note that some calendars don't support attachments; if you are including attachment you should save a second copy that does not include attachments. If you have an orphaned OST and can't recover the account using System Restore, you'll need to use a utility to export the contents to a pst file. The free OST2PST utility will only work with OST files created by Outlook 2002 and older. If you aren't sure what version of Outlook you used, try it; an error means the OST is not the correct type. OST2 Free Edition can convert up to 5 items in each folder of orphaned OST file. Use Enterprise Edition to convert and transfer all OST files to Microsoft Outlook. Import and export OST and PST files, from and to Microsoft Outlook, Exchange, Office 365, Outlook.com, Google and G Suite. Updated OST2 comes with improved performance of the software. Updated OST2 Software includes better handling of big Outlook data files and better handling of the application on different computer environments. Exchange OST to PST email conversion tool to convert OST file to PST file. Convert working or unusable OST file to into PST file. Use it to migrates all Outlook items from Exchange Offline Storage (.OST) file to Personal Storage File (.PST). Software converts and repairs the offline storage file (ost) to personal storage (pst) file so that it can be easily accessed with Outlook. Other saving options include .EML and .MSG where former is accessible with Outlook Express and latter with Outlook. If the ost file gets corrupt or damaged, OST to PST functions as ost recovery software. Stellar OST recovery software is the most efficient tool to convert Outlook OST file to PST file. The software successfully recovers all the components of .ost file such as emails, contacts calendar entries, attachments etc. The tool is able to convert OST file to working PST file in any instance of corruption. Free demo version is also available that previews all recoverable items of inaccessible .ost file. Kernel OST Viewer is a FREE utility to view the contents of OST files. It does not require Outlook installation. A connection with Exchange is also not required. Just select the OST file and it will mount it in its Outlook like GUI instantly. Free tool to convert older *.OST files to *.PST files. Works with ANSI format only, will not work with OST created by Outlook 2003/2007. 4Team OST2 turns out to cost $80; the free version is useless, since it will only output the first five records. This isnt new and it annoys me that they refer to it as Free. OST are still local copies of the mailbox on the server - the only exception is calendar & contacts in an imap account - if there are calendar & contacts folders labeled 'this computer only'. if you archived mail and deleted it from the server, it would be in a pst. When its deleted from the server, its deleted from the ost too. you are looking through any PST Repair Tool you will get numerous arrangements. Be that as it may, I prescribe you to utilize Microsoft inbuilt Inbox Repair Tool. With this instrument you initially select the undermined PST record in your framework, at that point check the debased PST document. Once the checking procedure is finished, you can choose the Repair alternative. In the wake of repairing process is finished, you can see the repair PST record. Sorry, but the inbox repair tool won't help converting ost files to pst files. Hi Diane - if I try to convert ost file to pst file would my old company know I am accessing my old email files? I have made a copy of my Outlook before I left the company. I just need my personal emails, contacts, calendar. No, they will not. Once you left and they disabled your account, they lost the ability to know what you do with anything in the ost. There is no free converter - the ones who advertise as "free" will let you view the contents of the ost but only export 5 or 10 messages. Any of the products in Tools in the spotlight (or Featured at the top of the page) will do a good job. Hi, I received an MS upgrade on an MS Surface 2 machine. This caused it to crash and my supplier could not restore it to working condition. They were able to copy my files including Outlook messages to a USB stick and I have saved them on a new Surface Pro using Windows 10. I now want to import them to Outlook, but this requires them to .pst files. I see that these messages are saved as .ost files, something I have never seen before but I am told is used by Exchange - which I have not used on these machines. How do I create a .pst file of these emails, please? There are about 3000 messages and I need very urgent access to them. I need real help from MS who seem to have caused this problem in the first place. ost files are also used by imap accounts. the mail in them should be in also in the mailbox on the server. you only need them if your calendar and contacts are also in them. If you need to get them out, you'll need to use an ost to pst program. I have to convert OST files to PST files, because I want to use some of the folders with mails from the old OST files in my new Office 365 accounts. I bought the KERNEL OSTPST convertor, but the conversion failed. It looked like as if KERNEL OSTPST failed working with WINDOWS10. I tried some of the other conversion tools, but non of these worked as promissed. Where can I get clear instructions. Perhaps you could offer me a better alternative? It works on windows 10 - I've tested it on it. Did you get any error messages? what happened when you tried it? The usual reason these programs fail is the data file is corrupt. Thank you, Diane, for a very useful page on converting OST to PST. You might consider removing Stellar OST to PST Converter from your Featured tools list. I installed the demo and could not "select 20 files from each folder" as they explain for their demo. I initiated a chat and asked about that and had one other question. After 30 minutes, they replied with something akin to "The folders you see are what you get," which, of course, did not answer my question of how to choose 20 files (since using Ctrl and/or Shft didn't work). But I tried again with my 2nd question which was "where is the Inbox folder", they replied with the same answer. I suspect I was speaking to a robot. I went back to their site later (after trying and buying the Kernel product) and, just for grins, I clicked on the Better Business Bureau icon at the bottom of their site. Lo and behold, they are not a member of the BBB.